Marco Island Forever?- We hope not! Well, I told you we were heading leisurely back to the bay, but we did not want it to be quite this leisurely. 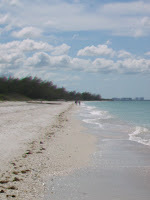 We only got to one anchorage past Fort Myers Beach which is Marco Island at Factory Bay. We had planned to stay two nights and it has now been four days longe r. We tried to leave on Thursday but the winds piped up to 20 -25 knots out of the south which is the direction we need to go. The waves were 5-7 feet and we were pounding terribly. I was so glad when Saltaire who was ahead of us, said they were turning back. We did too! Unfortunately, Marco Island is not the most cruiser friendly. If you want to land your dinghy, it costs $5 at Marco River Marina, the only place available in Factory Bay. There are grocery stores, pharmacies and other stores within walking distance, but we did not see one Laundromat. The first day that we walked around, my foot that I have had trouble with in the past and had been sore since we walked so much in Key West, seemed to be getting worse. So we found a walk-in clinic where I got a cortisone shot. Ooooooooooooooh, how I hate those shots but it did help. 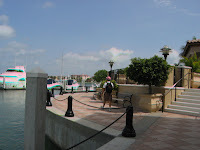 We explored by dinghy to find a public dock at the Esplanade which is an upscale group of shops, restaurants and condominiums located up another bay which we heard about from people on a nearby anchored boat. You can land your dinghy for free and it is near a Winn Dixie grocery store. Unfortunately, we were told the holding is not as good as Factory Bay so we stayed put. 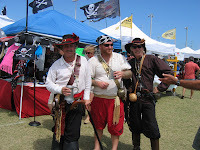 We got to our second Seafood Festival, and Marco Island’s first. It was not as good as Marathon’s but wasn’t bad for their first one. Al and I enjoyed some wonderful Coconut Shrimp. They had various groups playing and people selling crafts and their wares just like in Marathon, just fewer of them. 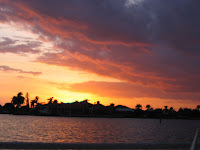 We have been doing a lot of reading, resting, checking of the weather, watching the pelicans catch their dinners and enjoying the beautiful sunsets. Hopefully we will be able to leave tomorrow, Monday, March 30, 2009 to do those same things, just elsewhere! We left Marathon after almost a month on a mooring ball there. We really liked the friendly atmosphere but were anxious to get moving once more. 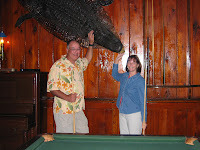 We were heading to the west coast of Florida with Nancy and Dave Hall on Saltaire. 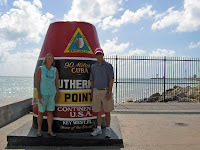 We motored under Seven Mile Bridge and through Moser Channel into Florida Bay and eventually into the Gulf of Mexico. Just as I was ready to put lunch on the table, we heard this funny noise and the engine shut down. We had wrapped a crab pot a round our prop. We called Saltaire who were motoring ahead of us, and they turned around to stand by, however, in so doing, wrapped their fishing line that was out in back of their boat around their prop! It was not too big of a deal for them, because being a catamaran; they can raise the prop and clear it off. We on the other hand had a bigger problem. Al wanted to go snorkeling, but I don’t think this was the type he had in mind! He had to go under the boat many times to cut the black polypropylene line and unwrap sections of it until it was off. It took about 35 minutes until we were free. There wasn’t a large float on it. The only float it had was about three inches wide, so no wonder Al did not see it in the water. After lunch we sailed for a while and then the winds died. We motored to Little Shark River which is part of the Everglades. It wasn’t a very pretty anchorage Dead trees lined the shore. We were wondering if it was caused by the hurricanes. It was a quiet anchorage, and when Dave and Nancy were going back to their boat after a game of Dominoes, we deemed it the darkest anchorage. It truly was in the middle of nowhere (no cell phone or internet connections) which made the stars seem super bright. 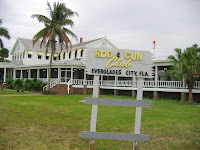 We reached the Rod and Gun Club in Everglade City late afternoon tying up to the ir bulkhead for the night. It was an interesting place having been built in th e late 1800’s and has kept the southern Florida Everglade rustic feel. Although there is not much in Everglade City it had some charming sites. 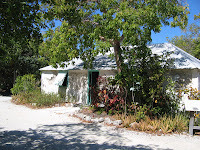 The Old Laundry Building which was the community laundry in the early 1900’ is now the Everglades Museum. They had a cute luncheonette a nd ice cream store with a vintage gas pump and antique car sitting out front. They had two restaurants, one being the Rod and Gun Club which is where the four of us chose to eat that evening. We had a nice dinner and a game of billiards afterwards. In how many restaurants can you get that combination? We awoke to rain but chose to leave for Little Marco Island after waiting an hour, becau se it was suppose to turn nice by afternoon and that is what it did. 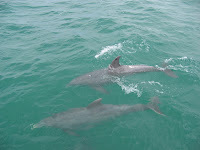 We were able to sail after the showers passed and once again had a great “dolphin experience.” There were 5 to 7 swimming around our boat an especially at the bow. They were around for so long Al went back in the cockpit because he was getting tired of watching them. I never get tired watching their graceful bodies glide through the water and having so much fun. One even squirted us with his spray from his blow hole as if in fun. We eventually entered Capri Pass and anchored between Little Marco Island and Keewaydin Island. It was a pretty spot but a lot of speed boat and fishing boat traffic. After 5pm when the rental boats are due in, it quieted down quite fast. 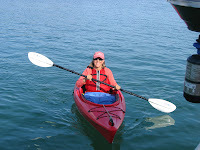 In the morning I took advantage of the quiet waters and had Al put our kayak in the water. I paddle around for a bit enjoying the peacefulness. Al readied the dinghy because we made plans with Dave and Nancy to go exploring and to get to th e ocean side of Keewaydin Island. We spoke to someone at one of the docks, and he said there were only seventeen houses on the island that have no electric or running water. We found the landing which was mentioned in our cruising guide where you could cross to the ocean and not be trespassing. We are so glad that we found it because it was a gorgeous beach with no more than 25 people on it and we walked for probably three hours. Nancy and I both collect shells and sea glass. This was wonderful for those two hobbies. We found the best shells yet and found some light green and turquoise sea glass which is the hardest to find. Our only regret is that we did not pack a lunch to be able to stay longer. That evening we shared a dinner together and had a wonderful meal, and as Al said, “It was better than any restaurant meal!” It was a great end to a great day. 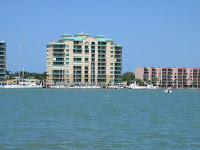 We left the Marco Island area and had a close reach sail all the way to Fort Myers Beach. You can tell you are getting to more densely populated areas seeing the cigarette boats and Para sailors all along the coast. Our friends Randy and Kathy on Intransition who left Marathon about 1 ½ weeks earlier were waving to us from the beach as we entered the inlet. We got tied to a mooring ball which the town had most recently put in about seventy of them, and so made it easier to obtain one, especially on a Saturday. We went in by dinghy to Mantanzas Inn to pay the $13 a night fee and went to dinner with Kathy and Randy who showed us around the facilities and a small section of the beach town. It definitely is a typical beach town. There are plenty of tee shirt shops, tattoo parlors and ice cream stores to visit. The guy’s eyes probably got tired goggling all the college coeds in their skimpy outfits! Al and I never got to go south for spring break during college but we did now, only a few years later! While we were with Kathy and Randy, Dave and Nancy had a friend visit with a car. They had dinner with him and the next day he offered to take us grocery shopping. We got our laundry and foo d shopping done on the same day and still had time to play! 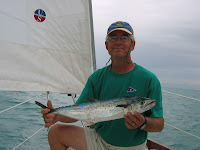 Their friend Perry suggested a visit to Sanibel by car. We were anxious to see the island and beaches and got to see quite a lot by car. The properties are just beautiful with their meticulously manicured properties. Their beaches were very nice for public beaches but we were spoiled with the mostly uninhabited island of Keewaydin which we had been to a few days before. 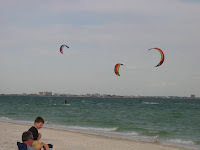 We got to see some great kite surfing with the guys doing all sorts of tricks near the Sanibel Lighthouse. 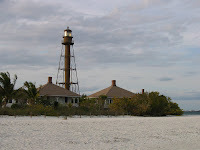 I would have liked to have seen the wildlife preserve on Sanibel but we ran out of time. We will have to save it for another trip! We plan to start our return to Marathon and then our leisurely return to the Chesapeake tomorrow. The big news in Marathon is that the marina got 3 new washers and 4 new dryers and took the old ones away. The dryers at least dry now and that is a good thing! They still could use more, but the sewer system cannot take too much is what we hear. Lastly, we saw them put the pumping station in for the marina, so they are getting closer to having the 16 new showers possibly working. We won’t see it before we leave next week, but they’re furthe r along than before! who built it out of tabby in the early 1900’s. He had made his living as a sponge harvester. Crane Point also had a Wild Bird Center where injured birds are cared for and released when possible. 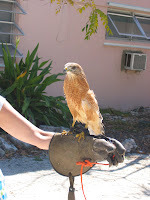 The lady here is holding a Redtail Hawk who had her left wing electrocuted and so has only one wing. 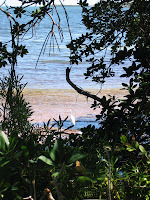 There were all sorts of nature trails as well as the Crane House which had a beautiful view of the Florida Bay. 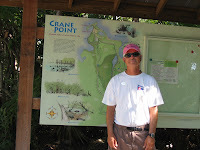 The owners were Francis and Mary Crane for whom Crane Point is named. It is nice to know that there will be some part of the Keys which will remain free of development. 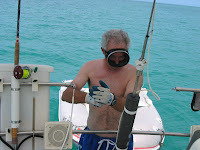 I finally convinced Al to leave the mooring to try t o get rid of the algae growing under his armpits. Just kidding! 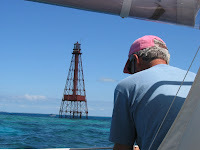 So we went out for a lovely sail to Sombrero Light and reef. We tied to a mooring ball and were hoping to snorkel but the 12 knot winds were blowing one way and the waves were going another which made us rock and bounce to the point that I felt sick. 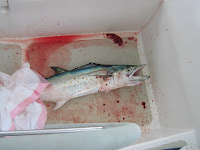 Luckily, I did not feed the fish and when we started sailing again I felt much better. We met several couples at the “Meet and Greet.” Two with whom we went to brunch the next day. Also another Bristol boat, named Pearl, came into the harbor and the fellow came over to introduce himself. We went over to see their lovely 43.3 center cockpit and meet his wife. Most of the couples are going up the west coast in a few days. 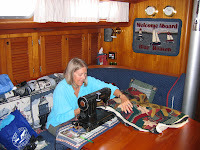 When I was talking with Pierre and Kathy on the Bristol, he asked what have I not liked about the cruising life. I said no offense to my husband, but I miss my girl friend time. Kathy‘s eyes got big and she agreed whole hardily. I have talked to other female cruisers and they all agree. It’s not bad when you meet another couple to hang around with because you do get that “girl time” then. But when you part from each other, you have to start all over to build a relationship where you talk about certain things. I don’t think men will ever understand this. The last big thing this week was the 33rd Annual Seafood Festival held at the Community Park right next to the City Marina in Marathon. The festival is one of the Keys largest events drawing 15,000 people. We went at 11:30 am and did not get back to the boat until 8:15pm. They had all sorts of fun things for young and old. The seafood line up was; fish, lobster, conch salad, conch fritters, stone crab claws, conch chowder and clams. Other goodies like fresh fried potato chips, key lime tarts, beer and other festival foods were available too. We enjoyed our first stone crab claws immensely. We also enjoyed the fish and spiny lobster caught by the local fishermen. 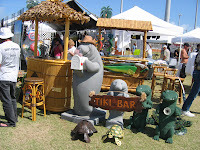 There were all sorts of booths from different organizations, arts and crafts and other wares for sale, and great soloists and bands f or entertainment from reggae to music of Pink Floyd. The last entertainer we heard was a guy named Howard Livingston, who sounded a lot like Jimmy Buffet but had his own original songs that were great. 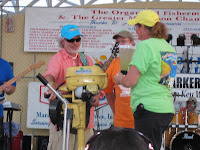 After one of the songs about margaritas, they actually made margaritas on stage using an old Johnson motor. I have a very short video clip when they were having trouble getting the engine running. They finally got it to run but only for three batches and they then discovered it was out of gas! They serve the drinks to the crowd in small paper cups which tasted quite good on a warm night. The festival runs for two days and raises money for various community organizations but a lot goes to help local children. The second day they had a fly over by the Navy as a tribute to our armed forces right at the crucial moment of the Star Spangle Banner which sent chills up my arms. It was very moving. We also saw Amber Leigh who is a 23-year-old singer specializing in crossover country music with a Celtic twist. Besides a great voice she also is a great fiddle and mandolin player. She has opened for such stars a Tim McGraw, Faith Hill, Toby Keith and more. Her band and she were fantastic. From the looks of the crowd, everyone seemed to enjoy her. If you ever get the opportunity, don’t miss the Seafood Festival in Marathon! We still have not got to go snorkeling. The winds just won’t let up. It seems it has been blowing 15-20 knots for the past five days and no end in sight. We have been doing our usual chores with a new one thrown in every once in a while. Al cleaned the bottom of the dinghy which included some scraping off of something gross growing on the bottom. I received the binding tape from a rug hooking friend back home that I needed to continue finishing my rug. So then I needed a sewing machine to sew it on. I found someone in yoga whose mate had an old, and I mean old, black Singer to do the job. Those old machines never seem to quit. Our friends Bob Halter and Ann Miller whom we visited in January in Venice were visiting friends on Key Largo and so came down for a day visit. We threw out some suggestions of what to do, and they wanted to go to Key West. We said fine even though we were there the week before beca use we certainly did not see everything and it is such an interesting place. Besides, we would be traveling in a comfortable car and not a bus. 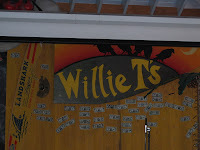 We went down Duval Street where all the action is and decided on Willie T’s for lunch. A great female guitarist and singer entertained us while we ate our delicious lunches. 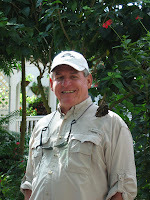 After lunc h we headed for the Butterfly Conse rvatory. It was great! 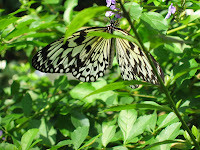 You walk into this tropical foliaged area where butterflies fly freely all around you. 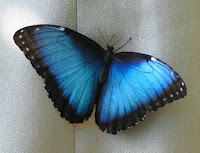 There were these gorgeous Baltic blue butterflies, as well as bright red and black winged ones and numerous others. It was considered good luck if one landed on you, so Bob should be the one to play the lotto. There was soothing music playing and beautiful flowers and also a v ariety of unusual birds. If you spent the time to really look all around you there was a lot to see. We really enjoyed it. By the time we were back near the waterfront, it was Happy Hour time. We enjoyed $2 Mojitos at one of the bars. We were both rather thirsty and found the minty drink very refreshing. 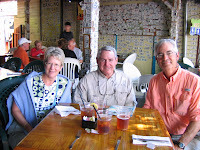 We had dinner in Marathon at the very casual Keys Fisheries Market and Marina. Shortly afterwards we said our farewells to Bob and Ann until we see them in Rock Hall in the spring. The next night we also said our farewells to Randy and Kathy who were continuing there journey up the west coast. We had four couples over on Blue Heaven for dessert. Since we missed the “Meet and Greet” at the marina due to being in Marathon, I had planned to take a dessert, so I had plenty. It was a great way to say our good-byes and hope to meet again. Al discovered that the single side-band might not be working top notch but we did get through to our Canadian friends, Jim and Jeannie, over in Belize. By way of email we set up a time and several frequencies in case one did not work. On the second frequency we got a good connection. We learned that they might not be back in the Keys while we are here, but we hope we can connect sometime on our return back to the Chesapeake. 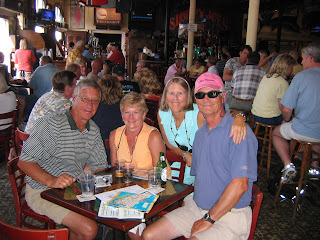 We headed to Key West using the bus with Kathy and Randy Chamberlin. We took the 8:26 AM bus at a cost of a m ere $3 per person or $1.50 for senior citizens. The hour ride gets you into the outskirts of Marathon at a shopping mall called Searstown. 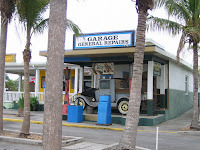 Then you pick up another bus for $2 to take you into the old town of Key West. We checked the waterfront to determine the anchoring situation which is questionable at best. They have a mooring field but it is awful in north winds which there have been many. Al is trying to determine whether we want to take the boat there. After visiting we decided not to do so. We had lunch at a small place called Pepe’s which most people would walk right by. Kathy and Randy have eaten there before and liked it, so we went in. 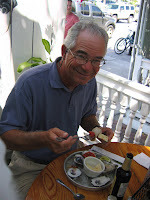 Once in, there was a cute courtyard where they served good oysters, burgers and grouper sandwiches. After lunch we walked by a store where an artist was working on sea glass jewelry. Anybody who knows me knows I love jewelry, and so I stopped. I asked the artist where she finds her sea glass. She replied Greece. I told her how much I love Greece and that we had chartered in Greece three times. She said maybe we had her husband as captain and I said no we had another married couple. She asked “Who?” I said Kosta and Lynda and she squealed “I was there maid of honor at their wedding!” It is amazing how small the world can be sometimes. We had fun talking about our mutual friends which also made me want to go back again! The men wanted to see some of the well known bars, so we passed Hog's Breat h Bar where a lot of Harley motorcycles sat. 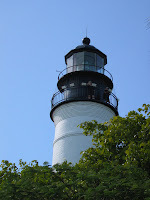 After a lot of people watching, we went into Sloppy Joes to rest our weary feet, and refresh our dry mouths after walking to the southern most point of the United States and to see the famous lighthouse which you can see in the pictures at the beginning of the blog. Both couples were craving pizza so we had a delicious pizza at Angelina’s before taking the bus back to Marathon. We got back to the boat around 9 PM exhausted. The next day while I went to yoga Al helped someone who requested assistance on the Boot Key cruiser’s net with a battery problem. After solving there problem, we biked to West Marine to pick up the navigation light we ordered and the extra bulb. Of course, the bulb was incorrect, so they will get us back in their store next Friday again. Do you think they do these things on purpose!?? Susan and Bill from a boat names Osprey came over to introduce themselves. They know our Canadian friends, Jim and Jeannie, and we made plans to get together another day. Kathy and Randy picked me up to go to the beach with them which was a perfect beach day. The first day of March, and we were hoping to go snorkeling but unfortunately the winds picked up before they were predicted. So instead we went to do some laundry. Not quite in the same fun category but it has to get done. I got my loads in immediately but there was such a back up on the dryers. I got the sheets in but it took an hour before they were done, so I took the towels and tee shirts out to the boat to dry on the life lines. Since it was cloudy and cool, winds up to 25 knots, Randy and Kathy came over for an afternoon of Dominoes. We don’t know if we will ask Randy back again since he slaughtered us! That evening I made pesto with my homegrown basil which I have on the boat and had a delicious basil vegetable pasta dish for dinner. My boat garden has to be good for something!